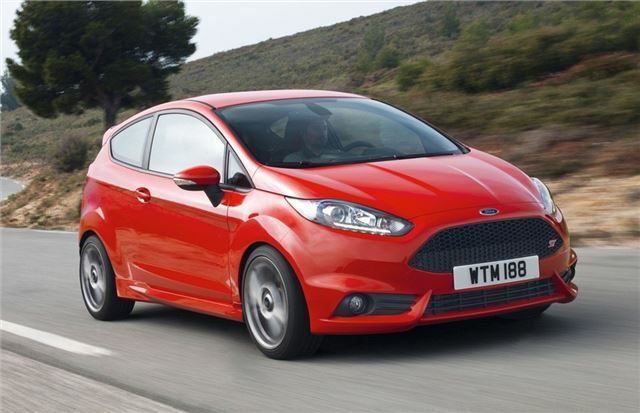 The long awaited Ford Fiesta ST, which is available to order now, will cost just £16,995. That's considerably less than alternatives like the SEAT Ibiza Cupra and Vauxhall Corsa VXR which are both more than £18,500. The first cars are due at dealers in March and there will be two trim levels. The standard Fiesta ST comes with 17-inch alloy wheels, halogen projector headlamps, ST front fog lights, DAB, SYNC connectivity, a Thatcham CAT 1 alarm, Recaro seats, My Key and air conditioning. There is also an ST2, prices at £17,995, which adds partial leather heated Recaro seats, a Sony DAB radio, keyless start, privacy glass and LED daytime running lights. Options include an ST Style Pack which includes grey painted alloy wheels with red brake callipers and illuminated scuff plates, a Sony sat nav system and climate control. Available as a three-door only, the Fiesta ST gets a black honeycomb grille, a large rear spoiler with twin air vents and twin exhaust. Paint choices including Molten Orange and Spirit Blue. Under the bonnet is the Ford 1.6-litre EcoBoost four cylinder petrol engine which combines high pressure direct injection with low inertia turbocharging. Maximum power is 182PS with torque of 290Nm which gives it a 0-62mph time of 6.9 seconds. Economy is impressive too with an official 47.9mpg and CO2 of just 138g/km.